The untold story of the root cause of America's education crisis--and the seemingly endless cycle of multigenerational poverty. It was only after years within the education reform movement that Natalie Wexler stumbled across a hidden explanation for our country's frustrating lack of progress when it comes to providing every child with a quality education. The problem wasn't one of the usual scapegoats: lazy teachers, shoddy facilities, lack of accountability. It was something no one was talking about: the elementary school curriculum's intense focus on decontextualized reading comprehension "skills" at the expense of actual knowledge. In the tradition of Dale Russakoff's The Prize and Dana Goldstein's The Teacher Wars, Wexler brings together history, research, and compelling characters to pull back the curtain on this fundamental flaw in our education system--one that fellow reformers, journalists, and policymakers have long overlooked, and of which the general public, including many parents, remains unaware. 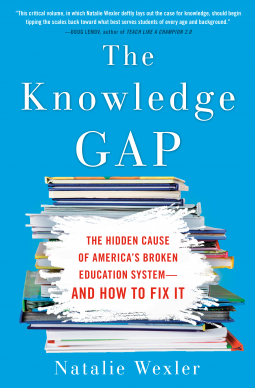 But The Knowledge Gap isn't just a story of what schools have gotten so wrong--it also follows innovative educators who are in the process of shedding their deeply ingrained habits, and describes the rewards that have come along: students who are not only excited to learn but are also acquiring the knowledge and vocabulary that will enable them to succeed. If we truly want to fix our education system and unlock the potential of our neediest children, we have no choice but to pay attention.